Metal Powder Fabrications and consolidations. Composites (metal, ceramic, polymer matrix and lamellar composites). Microstructure-physical, magnetic and mechanical properties relations in materials. Central Metallurgical R&D Institute (CMRDI), Cairo, Egypt. ·D. Phil (2004), Faculty of Science, University of Ain Shams, Cairo; Egypt. Class of Degree: First Class Honors. “Fine Ceramics Application” atJapan Fine Ceramics Center in the period from 9/5 to 21/7/2000. “Processing and Investigations of New Composite Materials” at the Institute of material Research of Slovak Academy of Science in the period 1/3 to 28/4/2004. “Design & Optimization of Laminated Composite Materials”, 8-9 May 2007 in Kavaq Business Intelligence Co., Kuala Lumpur, Malaysia. 1- Awarded the Price ofthe Egyptian Academy of Science and Technology (Prof. Venice Gouda)for Young researcher2010in advanced materials. 2- University of Helwan in Cairo; Egypt. 3- College of Science at Al Imam Muhammad Ibn Saud Islamic University in Riyadh; KSA. Introduction to Technology (an Introduction to Extractive Metallurgy). Finishing Processes and Non-Traditional Machining. Planning and Managements in the Industry. Powder Technology and sintering (Trainingof Engineering). - More than 50 graduated Projects in the field of materials science and testing at Helwan University, Cairo; Egypt and at the college of science in the Al Imam Muhammad Ibn Saud Islamic University, Riyadh; KSA. - Dr. Daoush has so far collaborated and co supervised for 15 PhD and Master’s Candidates. 1- “Study of Some co-Precipitated Peroveskite-Manganite Alloys” by EidK. Abdel-Khalek, Faculty of Science at Al Azhar University, Cairo Egypt (2006). 2- “Fabrication and Characterizations of silicon carbide reinforced aluminum matrix nanocomposites”by Mohamed Hashish, Faculty of Engineering at Zagazig University, Zagazig Egypt (2013). 3- “Processing and development of New Tungsten Heavy Alloys Products” by Mohamed A. Sayed, Faculty of Engineering at Helwan University, Cairo, Egypt(2015). 4- “ Preparation of (Ta,Nb)C/Ni Cermets Suitable for Cutting Tools” by Hossam. M. Yehia, Faculty of Industrial Education at Suez University, Suez, Egypt (2016). 1- “Synthesis and Properties of Iron-Base Compositethrough Powder Metallurgy”by El Sayed K. Maree Khalil, Faculty of Engineering at Al Azhar University (2015). 2- “Processing and Characterization of Boron Nitride/Nickel Copper Matrix Composite as Cutting Tool Materials” by Ahmed A. El Tantawy, Faculty of Industrial Education at Suez University, Suez, Egypt (2016). 3- “Fabrication and Characterization of Fabrication and Characterization of Copper/Silicon Nitride Composites” by Mahmoud A. Ahmed, Faculty of Industrial Education at Suez University, Suez, Egypt (2016). 4- “Preparation and Heat Flow Investigations of copper matrix composites as Electronic Component coolants”by Ahmed H. Swedan, Faculty of Industrial Education at Suez University, Suez, Egypt (2016). The facilities include powder Fabrication facilities, water atomization, cold compaction, bench and industrial scale vacuum and N/H gas sintering furnaces. Mechanical alloying apparatus, powder rotator mixer, high accuracy digital balance, powder presses and dies, abrasive cutter, sieve analysis/shaker capabilities, high-temperature tube furnace, and microscopes with image analysis facility, materials polishing, grinding and specimen mounting capabilities facilities among others. - Member (reviewer) in the committee of the metallurgy, petroleum and mining at the Supreme Council of Universities-Egypt (2016-2019). - Member In the International Technical Committees of the international Conference on Advanced Materials, Technology and Application in Bali Island, Indonesia, 2018. - Editor of the international journal of Materials Sciences and Applications 2017. - Editor of the SciFed Materials Research Letters 2017. - Member of the Organized Committee of the 2017 International Conference on Mechanics of Composite Materials (ICMCM 2017)Bangkok, Thailand. - Lead Guest Editor of the special issue in metallic nanoparticles of the journal of nanotechnology 2017. - Associate Editor of the journal of Materials Sciences and Applications 2016. - Associate Editor of the journal of Nanomedicine Research 2016. - Fulbright Alumni 2014-2015 at San Diego State University, California, USA. - Member in the Materials Research Society since 2010. - Member in the American Nano Society since 2010. - Member in the Chemical Engineering Division of the American Chemical Society since 2010. - Member in the FP7 European commission experts 2009. - Member in the International Nanoscience Community since 2007. - Member in the Egyptian Syndicate of Scientific Professions since 1994. Journal of Super lattices and Microstructures. Journal of Thin Solid Films. Book Reviewer for “Materials: Introduction and Applications” by Prof. WitoldBrostow and Prof. Haley E. HaggLobland, Published by Wiley (2017). Book Reviewer for “MaterialsProcessing: A Unified Approach to Processing of Metals, Ceramics and Polymers” by Prof. Lorraine F. Francis, Published by Academic Press Publications (2016). Book Reviewer for "Nanostructured Carbon Materials for Catalysis” by Prof. Philippe Serp and Bruno Machado, published by Royal Society of Chemistry (2015). Book Reviewer for "NanostructuralBioceramics: Advances in Chemically Bonded Ceramics" by Prof. Leif Hermansson, published by Taylor and Francis (2015). Book Reviewer for "Bionanomaterials for Dental Applications" by Prof. MieczyslawJurczyk, published by Taylor and Francis (2014). 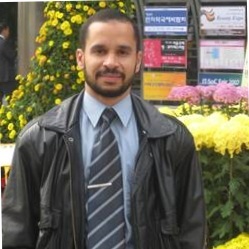 Book Reviewer for "Nanoscience and Nanotechnology in Engineering” by Prof. Vijay K. Varadan, A. SivathanuPillai, DebashishMukherji, MayankDwivedi and Linfeng Chen, published by World Scientific (2010). 1-Licensed:Method for manufacturing high hardness coating powder with good high temperature stability and improved surface characteristics and strength: KR 1492969 (priority date: Feb. 16, 2015) inventors Park, HuiSeop; Ryu, Min Ho; DAOUSH, WALID M.; HONG, SUN HYEONG. Patent Assignee Name: ILJIN DIAMOND CO LTD.
2-Licensed:Coating powder used for cutting tool, is obtained by maintaining furnace containing coating material of titanium and solution of primary and secondary salt, at predetermined temperature such that molten salt reaction is carried out: WO2010056077-A2 ; KR2010054511-A ; WO2010056077-A3 ; WO2010056077-A9 ; KR1492969-B1(priority date: Nov. 14, 2008)inventors:DAOUSH W M, HONG S H, PARK H S, RYOO M H, HONG S, PARK H, RYU M, WALRIDEU EM. D. Patent Assignee Name: ILJIN DIAMOND CO LTD.
“Nickel Coated Powder Approach for Advanced Materials” Edited by Walid M. Daoush, Sayed F. Moustafa and Sayed T. AbdElreheem, published by Lambert Academic Publisher. Chapter on Improvement of the Reinforcements Distribution in the Composite Matrices Using Powder Coating Process “in Handbook of High Performance Coatings for Automotive and Aerospace Industries, edited by Abdel Salam HamdyMakhlouf, published by Nova Science Publisher, authors: Walid M. Daoush, Byung K. Lim, Hee S. Park, Sayed F. Moustafa, and Soon H. Hong, pp.301-324. https://www.novapublishers.com/catalog/product_info.php?products_id=11740. Dr. Daoush’s publications have been so far cited more than 515 times, with an h-index of 11 (According to Google scholar Citation). 45-Mohamed A. Sayed, Osama M. Dawood, Ayman H. ELSayed, Walid M. Daoush, “Application of Taguchi Method in Optimization of Process Parameters of ODS WHAs” Advances in Materials Research, Vol. 6(1) 79-91(2017). 44- Walid M. Daoush”Co-Precipitation and Magnetic Properties of Magnetite Nanoparticles for Potential Biomedical Applications”, Journal of Nanomedicine Research, Vol. 5(3) 118-123 (2017). 43.WalidM.Daoush, J. Yao, M. Shamma, K.Morsi “Ultra-rapid Processing of High-hardness Tungsten-Copper Nanocomposites”,ScriptaMaterialia, Vol. 113, 246-249 (2016). 42.WalidM.Daoush, AymanElsayed, Omayma El Kady, Mohamed Sayed, OsamaM. Dawood“Enhancement of Physical and Mechanical Properties of Oxide Dispersion Strengthened Tungsten Heavy Alloys”, Metallurgical and Materials Transactions A, Vol.47, Issue 5, 2387-2395(2016). 41.WalidDaoush, Ahmed Swidan, GamalAbd El-Aziz, Mohamed Abdelhalim “Fabrication, Microstructure, Thermal and Electrical Properties of Copper Heat SinkComposites”, Materials Sciences and Applications, Vol 7, 542-561 (2016). 40.Mahmoud A. Ahmed, Walid M. Daoush, Ahmed E. El-Nikhaily” Fabrication and characterization of Copper/Silicon Nitride composites”, Advances in Materials Research, Vol. 5, No. 3, 131-140 (2016). 39. K. Morsi,Walid M. Daoush “Al-TiH2 Composite ‘Particles’ as foaming Precursors for Metallic Foams”, ScriptaMaterialia, Vol. 105, 6-9 (2015). 38.H. M. Yehia, Walid. M. Daoush, A. E. El-Nikhaily”Microstructure and Physical Properties of Blended and Coated (Ta, Nb)C/Ni Cermets”, Powder Metallurgy Progress Vol.15, No.2, 262-271(2015). 37.Walid M. Daoush, Omayma A. El Kady ,Amal. A. AbdElgany, Mohamed A. Ghanem , Ahmed E. El-Nikhaily “ Microstructure, Hardness and Magnetic Properties of (W:Ti)C-Ni Cemented Carbides” Journal of Japan Ceramic Society, in Press (2015). 36. AymanElsayed, Wei Li, Omayma A. El Kady, Walid M. Daoush, Eugene A. Olevsky, Randall M. German“Experimental Investigations on the Synthesis of W-Cu Nanocomposite through Spark Plasma Sintering”, Journal of Alloys and Compounds, Vol. 639, 373-380 (2015). 35.Walid M. Daoush, Hee S. Park, FawadInam, Byung K. Lim, and Soon H. Hong “Microstructural and Mechanical Characterization of Ti-12Mo-6Zr Biomaterials Fabricated by Spark Plasma Sintering”, Metallurgical And Materials Transactions A, Vol. 46A, No. 3, 1385-1393 (2015). 34.Walid M. Daoush, ToyokoImae “ Fabrication of PtNi Bimetallic Nanoparticles Supported on Multi-Walled Carbon Nanotubes", Journal of Experimental Nanoscience, Vol. 10, No. 5,392–406 (2015). 33.Walid M. Daoush, A. Francis, Y. Lin, R. German “An exploratory investigation on the in-situ synthesis of SiC/AlN/Al composites by spark plasma sintering”, Journal of Alloys and Compounds,Vol. 622, 458-462 (2015). 32.Walid M. Daoush, OmaymaElkady "Microstructure, Physical Properties and Hardness of Al2O3 Short Fibres/Ni Matrix Composites Fabricated by Powder Technology", Journal of Composite Materials, Vol. 48, No. 30, 3735-3746 (2014). 31. Walid M. Daoush, Hee S. Park, Soon H. Hong “Fabrication of TiN/cBN and TiC/Diamond coated particles by titanium deposition process”, Trans. Nonferrous Met. Soc. China, Vol. 24, 3562−3570 (2014). 30. Walid M. Daoush, Byung K. Lim, Dong H. Nam and Soon H. Hong "Microstructure and mechanical properties of CNT/Ag nanocomposites fabricated by spark plasma sintering" Journal of Experimental Nanoscience, Vol. 9, No. 6, 588-596 (2014). 29.FawadInam, Badekai R Bhat, Thuc Vo, Walid M. Daoush "Structural health monitoring capabilities in ceramic - carbon nanocomposites" Ceramic International , Vol.40, No.2, 3793-3798 (2014). 28. Walid M. Daoush, Soon H. Hong "Synthesis of multi-walled carbon nanotube/silver nanocomposite powders by chemical reduction in aqueous solution", Journal of Experimental Nanoscience, Vol. 8, No. 5, 578–587 (2013). 27.Zeinab Abdel Hamid, Sayed F. Moustafa, Walid M. Daoush, Fatema Abdel Mouez, Mona Hassan "Fabrication and Characterization of Tungsten Heavy Alloys Using Chemical Reduction and Mechanical Alloying Methods", Open Journal of Applied Sciences, 3, 15-27(2013). 26. A.A. El-Daly, M. Abdelhameed, M. Hashish, Walid M. Daoush “Fabrication of silicon carbide reinforced aluminum matrix nanocomposites and characterization of its mechanical properties using non-destructive technique”, Materials Science and Engineering: A 559, 384-393(2013). 25.Walid M. Daoush,ToyokoImae "Syntheses and Characterizations of Multi-walled Carbon Nanotubes-Supported Palladium Nanocomposites", Journal of Materials Research, 27(13)1680-1687 (2012). 24. Sayed F. Moustafa, Walid M. Daoush, Ahmed Ibrahim, Erich Neubauer "Hot Forging and Hot Pressing of AlSi Powder Compared to Conventional Powder Metallurgy Route", Journal of Materials Sciences and Application, Vol. 2, 1127-1133 ( 2011). 23. Walid M. Daoush"Synthesis and Characterizations of Nanosized Fe3O4 for Biomedical Applications", World Journal of Engineering Vol.2, 161-162 (2010). 22.Wei Li, Walid M. Daoush, AdityaBothate, Z. Abdel-Hamid, RidvanYamanoglu, Eugene Olevsky, SayedMoustafa, Randall M. German. "Influence of Powder Preparation on Consolidation Behavior and Properties of Tungsten-Copper Alloys", Advances in Powder Metallurgy&Particulate Materials, Vol. 1, 245-257 (2010). 21.H.A.Sallam, W.M.El-Meligy, E.A.Mohamed, Walid .M.Daoush, A.G.Moustafa "Utilization of the Hyperfine Structure of the Doped Iron Nuclei to Elucidate the Structural, Electric and Magnetic Properties of La1-xCaxMn0.95Fe0.05O3 Perovskite System", Arab Journal of Nuclear Science and Applications, Vol. 43, No 1, 138-150 (2010). 20. Walid M. Daoush, B.K.Lim, C.B.Mo, D.H.Nam, S. H. Hong "Electrical and Mechanical Properties of Carbon Nanotube Reinforced Copper Nanocomposites Fabricated by Electroless Deposition Process" Materials Science & Engineering A, Vol. 513-514, 247- 253 (2009). 19.Walid M. Daoush, Hee S. Park, Kyong H. Lee, Sayed F. Moustafa, Soon H. Hong " Effect of Binder Compositions on Microstructure, Hardness and Magnetic Properties of (Ta, Nb)C-Co and (Ta,Nb)C-Ni Cemented Carbides, Inter. J. of Ref. Met. and Hard Mat., Vol.27, 669-675 (2009). 18.Walid M. Daoush, Kyong H. Lee, Hee S. Park, Soon H. Hong“Effect of Liquid Phase Composition on the Microstructure and Properties of (W, Ti) C Cemented Carbide Cutting Tools “Inter. J. of Ref. Met. and Hard Mat., Vol. 27, No.1, 83-89 ( 2009). 17.Walid M. Daoush, Sayed F. Moustafa "Coated powders 'a good base' for intermetallics" Metal Powder Report, Vol 63, No 11, pp. 16 (2008). 16. A.G. Mostafa, E.K. Abdel-Khalek, Walid M. Daoush, M.Y.Hassaan "Structural, Magnetic and Electrical Transport Properties of the La0.70Sr0.30Mn0.9657Fe0.04O3+δ Perovskite" Journal of Hyperfine Interaction, vol. 184, pp. 167( 2008). 15.Walid M. Daoush "Processing and Characterization of CNT/Cu Nanocomposites by Powder Technology" Journal of Powder Metallurgy and Metal Ceramics, Vol. 47, Nos. 9-10, pp 531(2008). 14. A.G. Mostafa, E.K. Abdel-Khalek, Walid M. Daoush, S.F. Moustfa, “Study of Some co-Precipitated Manganite Peroveskite Samples Doped Iron” Journal of Magnetism and Magnetic Materials, Vol. 320, No.24, pp 3356 (2008). 13. S. H. Kaytbay and Walid M. Daoush “Phase Identification and Magnetic Properties of Nanocrystalline Fe50Cu50”, Journal of Powder Metallurgy Progress, Vol.7, No.2, pp. 111 (2007). 12.Walid M. Daoush and O.A. Elkady “Beating the force field with PM shield materials” Metal Powder Report, Vol 62, No 8, pp. 22(2007). 11.Walid M. Daoush "Synthesis and Consolidation of Nano-Sized NiCo Powder by Powder Technology Rout"; Mater. Sci .Forum, Vols., 561-565, pp. 1425 (2007). 10.Walid M. Daoush, Kyong H. Lee, Hee S. Park, Soon H. Hong "Effect of Metallic Binder Composition on Microstructure and Hardness of (W, Ti)C Cemented Carbides" J. of Korean Powder Metallurgy Institute, Vol.14, pp.208 (2007) (in Korean). 9.Walid M. Daoush "Processing of FeCoNanosized Soft-Magnetic Material by Powder metallurgy Technique" Mater. Sci .Forum, Vols., 558-559, pp. 707 (2007). 8.Walid M. Daoush, and Sayed F. Moustafa “Coating points a way for synthesis of tough intermetallics”, Metal Powder Report, Vol. 62, No. 1, pp. 30 (2007). 7. S.H. Kaytbay S.F. Moustafa and Walid M. Daoush “Solid-State Reaction in Al-Fe Binary System Induced by Mechanical Alloying” Journal of Defect and Diffusion, vol.272, pp. 15 (2007). 6. Sayed F. Moustafa, Walid M. Daoush "Synthesis of Nanosized Fe-Ni Powder by Chemical Process for Magnetic Applications,” journal of Materials Processing Technology Vol. 181, pp.59 (2007). 5. S.H. Mansour, N.M.Ahemed and WalidM.Daoush “Studies on Magnetic Pigmented Polyester Composites”, Polymer-Plastics Technology and Engineering, Vol. 46, pp. 85 (2007). 4.A. Francis, Walid M. Daoush "Synthesis and Magnetic Characteristics of Crystallized Ceramic in the BaO–NiO-TiO2–Fe2O3 System,” journal of Materials Processing Technology Vol. 181, pp. 213 (2007). 3.Walid M. Daoush and Sayed F. Moustafa “Processing of Metallic Filters by Powder Metallurgy Technique” Journal of Powder Metallurgy Progress, Vol. 6, No.4, pp. 164 (2006). 2. S.H. El-Sabbagh, N.M. Ahmed, Walid M. Daoush “Colored Rubber Vulcanizates with Some Magnetic Properties” Journal of Applied Polymer Science, Vol. 102, pp. 494 (2006). 1. Sayed F. Moustafa, Walid.M. Rashad Daoush, E.E. El- Shereafy “Cu/Matrix Composites Produced with either Coated or Uncoated Reinforcement Powders” Canadian Metallurgical Quaterly, Vol. 40, No., 4, pp. 533 (2001). 11-El Kady, O.A.,Daoush, W.M.,Elsayed, A., Abdallah, M., Dawood, O.M.“Enhancement of physical and mechanical properties of oxide dispersion strengthened tungsten heavy alloys” Euro PM 2014 Congress and Exhibition. 10- H. M. Yehya, W. M. Daoush, M. H. El-Sayed,A. E. El-Nikhaily”Effect of Ni Binder Content on Microstructure, Hardness and Wear Properties of (Ta, Nb) C/Ni Cermets Fabricated by Powder Mixing and Coating Routs”3rd International Conference in Africa and Asia on Welding and Failure Analysis of Engineering Materials, 2-5 November, 2015, Luxor, Egypt. 9-HalfaHossam, DaoushWalid “Preparation of 2-5 µm Magnetite Powder from High Carbon Ferrochrome (Fe-Cr) Alloy”, 23rd International Conference on Metallurgy and Materials, METAL 2014, 21-23 May 2014, Brno, Czech Republic. 7- Walid. M. Daoush, E. Gordo, P. Alvaredo, El Sayed K. Maree, Sayed F. Moustafa, Zeinab Abdel Hamid, Ahmed A. Atlam, Amir A. El Sayed“Microstructure and Hardness of Fe-TiCNCermets Fabricated by Powder blending and Powder Coating Routes Followed by Powder Metallurgy Process” The 2012 World Congress on Advances in Civil, Environmental, and Materials Research (ACEM’12), COEX, Seoul, South Korea,, 26-30 (August) (2012). 6-Walid M. Daoush,W. Bradbury, E. Olevsky, Randall M. German” Consolidation of Si3N4/Cu Composite powders Fabricated by Electroless Deposition Technique” 18th International Conference on Composites Materials, ICCM 2011; Jeju; South Korea; 21 - 26 August 2011, Code 96311. 5-Wei Li, Randall M. German, AdityaBothate,Walid M. Daoush, Eugene A. Olevsky, Z. Abdel-Hamid, Sayed F. Moustafa“Barriers of W-Cu Alloy Consolidation by Spark Plasma Sintering" 8th International Conference on Tungsten, Refractory and Hardmaterials 2011; San Francisco, CA; United States; 18 - 21 May 2011, Code 98754. 4-Randall M. German, AdityaBothate, Wei Li, Eugene A. Olevsky, Walid M. Daoush, Sayed F. Moustafa “Advances in W-Cu: New Powder Systems" 8th International Conference on Tungsten, Refractory and Hardmaterials 2011; San Francisco, CA; United States; 18 - 21 May 2011, Code 98754. 3- Randall M. German, Wei Li, Walid M. Daoush, AdityaBothate, Z. Abdel-Hamid, RidvanYamanoglu, Eugene Olevsky, SayedMoustafa” Powder fabrication role in the sintering and properties of tungsten-copper alloys” Proceedings of the World Powder Metallurgy Congress and Exhibition, World PM 2010. 2-Walid M. Daoush "Processing and Characterizations of CNT/Cu Sintered Materials" The 1st International Conference in Advanced Materials and Nanotechnology, NRC, Cairo, Egypt 3-5 Dec. (2007). 1- S. F. Moustafa, Z.Abdel-Hamid, S.S Abdel Rehim, W.M. RashadDaoush “Processing of Ni/Al intermetallic and its composites using coating route” Powder Metallurgy World Congress & Exhibition, PM 2004, Vienna, Austria, 17-21 Oct. (2004). 1. 2015 international conference of Powder Metallurgy and Particulate Materials, San Diego, California, USA, 17-20 May(2015). 2. The fourth international conference of BeniSuef University, Egypt, 18-19 Feb. (2014). 3. International Conference on Composite Materials (ICCM18), ICC, Jeju Korea, 21-26 Aug. (2011). International Conference on Materials Imperatives in the New Millennium [MINM2010] Cairo, Egypt, 29 Nov.-2 Dec. 2010. First International Pharmaceutical Sciences Conference, Tanta Univ., Egypt, Nov. 18-19, 2009. 2008 Full conference of Korea Powder Metallurgy Institute, Nov. 13-14, 2008. Spring Symposium of Korea Powder Metallurgy Institute, Chunbuck Univ., April 10-11, 2008. The sixth Korea-Japan Joint Symposium on Composite Materials, 1-2Nov. (2007), POSTEC, Korea. 1st Workshop of the Advanced Materials & Applied Nanotechnology Group, AMANTG (26-27, Nov, 2006), NRC, Cairo, Egypt. First Afro-Asian Conference on Advanced Materials Science and Technology (AMSAT06), Nov.13-16, 2006, Cairo, Egypt. Powder Metallurgy Congress and Exhibition, (24-28 Sept. 2006) Busan, Korea. The US-Egypt Workshop on Synthesis, Characterizations and Industrial Applications of Nanoparticles and Nanostructure Materials, at 12-15 Nov. 2005, Mubarak City, Alexandria, Egypt. 4th Japanese-Mediterranean Workshop on Applied Electromagnetic Engineering for Magnetic, Superconducting and Nano materials, at 17-20 Sept., 2005, Cairo., Egypt. 14. Us-Egypt Workshop on Advances in Science and Technology of Treatment and Utilization of Industrial Wastes, at Jun 6-10, 2004, Cairo Egypt. International project with Department of Materials Research at ARC Seibersdorf Research Center GmbH, Seibersdorf, Austria entitled "Copper-Graphite Composite" from 2001-2003 (Role-Co PI). US-Egypt international project with San Diego State University and NSF entitled"Development of Nanosized W-Cu composites by Powder Technology Process" from 2009-2012 (Role-PI and Co PI from 2012 to 2016). National Project with the Egyptian Science and Technology Development Foundation entitled "Development of Tungsten Heavy Alloys for Replacing the Imported Products" from 2009-2011 (Role- Co PI). International Project PCI Mediterraneo funded by AECID with Carlos III University entitled "Development of a New Generation of Tool Materials Using Powder Metallurgy Processing" from 2010-2012 (Role PI).